This post was sponsored by Lunchbox. All opinions are my own. All parents have been there. We have all stood there looking at our beloved child completely covered in you-know-what. No, I’m not talking about macaroni and cheese. I’m talking about macaroni and cheese about a day after it has been eaten. We stand there, looking at the smelly mess that is EVERYWHERE and we know there is one inescapable truth, one bottom line, only ending to this story: we are the ones that are going to have to clean it up. Yup, I have been there a few too many times. Between my preschooler and my toddler, I have cleaned up more messes than I want to think about. When it comes to the potty messes, I depend and trust Huggies wipes. Now Huggies has new TRIPLE CLEAN LAYERS that is gentle enough on baby’s skin, but thick enough to clean the mess. This is hugely important for those of us with babes who have sensitive skin. Jonah suffered for the first few years with rashes and eczema. It was imperative that I used a sensitive skin wipe for him, but some of those sensitive wipes would not be strong enough to tackle huge messes. HUGGIES wipes with new TRIPLE CLEAN LAYERS are helping you solve this issue, giving an even better clean while still being gentle on your baby’s skin. The search is on to find HUGGIES Testers who will be featured on the HUGGIES page on Walmart.com! 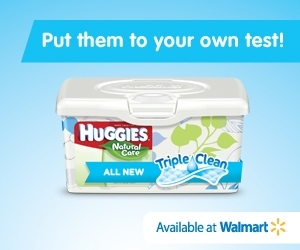 All throughout this month Huggies will be looking for HUGGIES Testers to be featured on http://see.walmart.com/huggies. All you need to do is submit yourself as a HUGGIES Tester and you could be chosen to be featured on the page. You can let all your friends and family know what you thought about the new TRIPLE CLEAN LAYERS. Get your entry in today! Don’t just take my word for it, be your own HUGGIES Tester every day by putting HUGGIES to the ultimate test- real life. Get your pack of HUGGIES wipes with new TRIPLE CLEAN LAYERS at Walmart and see the superior difference for yourself. Once you’ve put TRIPLE CLEAN LAYERS to the test, share your experience as a Official Tester with your friends! You can also get a coupon text by calling **BABY (on your cell phone) to learn more about the program! I love getting a good deal on a fantastic wipe that will be sensitive to my child’s skin, yet keep them clean. What more could you ask for? I hope I see some of your stories on the Huggies page of Walmart.com! *This post was sponsored by Lunchbox. All opinions are my own. We use Huggies wipes & I can’t wait to try this new kind out! My son’s skin is very sensitive so this will be awesome. wow this is very interesting! Before I was a mom, I thought wipes were for baby bottoms. Two kids later, I know they are for much, much more. I love Huggies wipes! They’re the only brand we use. Nick got a stain on my carpet last year (it was an orange veggie, but I can’t remember the exact type now). No matter what I tried I couldn’t get the stain up, and then I tried Huggies wipes, and now the stain is gone!